This is what we know so far in the Kurt Busch case: On Thursday, the Delaware Department of Justice ruled it believes it had “insufficient” evidence that Busch grabbed ex-girlfriend Patricia Driscoll by the neck and bashed her head against the wall of his motorhome last September at Dover International Speedway. As a result, Busch will not face any criminal charges. We also know that a Delaware family court judge believes Busch did indeed assault Driscoll on the night in question, issuing a civil protection order on Feb. 20 that barred Busch from any contact with his accuser and ordering him to commit to counselling. In the immediate aftermath of that decision, NASCAR suspended Busch from any of its sanctioned racing series and his Stewart Haas Racing team replaced him in the Daytona 500 and last week at Atlanta with Regan Smith in the No. 41 Chevrolet. Smith is scheduled to race the car again on Sunday at Busch’s home track, Las Vegas Motor Speedway. In the meantime, Busch has agreed to “NASCAR’s terms and conditions for consideration of reinstatement.”. What that means is that NASCAR has called in an outside expert who will monitor Busch’s progress and make recommendations. 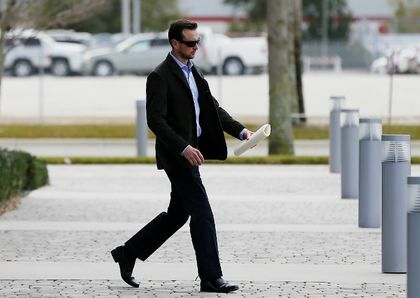 “Kurt Busch’s eligibility for reinstatement will continue to be governed by that program ... though the elimination of the possibility of criminal charges certainly removes a significant impediment to his reinstatement,” NASCAR information boss David Higdon said on Thursday. Certainly Busch’s past antics — drunk driving, dropping F-bombs on live television and threatening media — make him the perfect poster boy for a major forced attitude adjustment. His career-long behavioural problems have embarrassed NASCAR. Just check out the vitriolic war of words between Busch and Driscoll. Driscoll alleged Busch was a violent, out of control alcoholic and Busch described her as a venomous jilted lover. In the end, the Delaware Attorney General clearly did not believe Driscoll’s tale of the events at Dover. “After a thorough consideration of all of the available information about the case, it is determined that the admissible evidence and available witnesses would likely be insufficient to meet the burden of establishing beyond a reasonable doubt that Mr. Busch committed a crime during the September 26th incident,” AG official Carl Kanefsky said. Busch said the decision was vindication of his insistence he never assaulted Driscoll. Driscoll’s view of the decision was much different. In the court if public opinion both Busch and Driscoll are guilty of discreditable conduct. Verizon IndyCar Series driver James Hinchcliffe has seen more changes in the past six months than at any time in his young career. The Oakville native moved from the Andretti Autosport to Schmdit Peterson Motorsports in the off-season and changed from Chevrolet to Honda as a result. Now comes news he won’t be using the No. 77 that has been assigned to him. On Thursday, SPM announced a sponsorship deal for Hinchcliffe with Denver-based technology company Arrow Electronics and that the car will be No. 5 to spread the word about Arrow’s Five Years Out initiative. “The Five Years Out philosophy shows that Arrow sets the bar high, and that’s exactly what we want to do in the Verizon IndyCar Series,” Hinchcliffe said in a statement. It’s a good job Formula 1 doesn’t have a tampering policy because it turns out that Ferrari had been after four-time world champion Sebastian Vettel for several seasons while he was at Red Bull, before signing him at the end of last season. “In the winter between 2012 and 2013 I went in secret to Maranello to talk with (Luca di) Montezemolo,” Vettel told Italy’s Gazzetta dello Sport. Vettel said he was first approasched by then team boss Stefano Domenicali as long ago as 2008 — when he raced for Toro Rosso. Although it may seem like this winter is never going to end in Canada, a sign that spring may not be far off is the Motorama Custom Car & Motorsports Expo that runs March 13-15 at Toronto’s International Centre, across from Toronto’s Pearson International Airport. This year it will include the Drag Racing Night of Champions on March 13, while the Stock Car Night of Champions will take to the Johnsonville Stage on March 14. ... Don’t shed any tears for NASCAR track owners. While ticket sales have slowed by 2.5% from 2013 revenue from NASCAR’s television package increased by 4.5% in 2014. Last season, ticket sales accounted for $239 million US at tracks while that TV money amounted to $388 million. ... And in a tweet Friday, IndyCar star Ryan Hunter-Reay announced birth of second child: Little baby RHR 2.0 came into the world today at a healthy 8lbs 4oz. Mom @BeccyGordon & baby are doing great.